Hello, my name is Zach Shahan, and I have a problem. I’m a political nut. More seriously, I’ll admit that I’m strongly drawn to politics, follow policy & politics closely (some might say obsessively), and have sometimes struggled with how much time and emotion I invest into all of that. If I step back a bit and reflect on that passion and involvement, what often drives me in this matter is a desire for fair, humane, compassionate systems and policies. There are other ideals people bring with them into the political arena. Some want the most hyper-efficient economic and technological progress possible, for example. Either way, though, if you look at the US political system and economy objectively, I think it’s absolutely clear that we have a problem. Yes, the US has a problem. Shocked? But how much do people actually understand about the details of what they’re discussing? Even at this “high level” of discussion, I think there’s basically a fundamental misunderstanding of reality across much of the Republican leadership (the ones who are actually in politics because of ideals, of course — never mind the ones who are just there for power and money). These party leaders often think that certain policy theories/approaches are absolutely good and others are absolutely bad. They don’t typically acknowledge that there is variation, nuance, and relativity involved. They don’t acknowledge — and maybe don’t understand — that salt is good but not if you consume too much of it. A top-down, communist political system is not a good end goal, but neither is a libertarian anarchy void of any government regulation or oversight. Remember, a democratic government is of the people and by the people — in ideal form. Sure, there’s some corruption at play in reality (I’ll get to that in a moment), but the basic point is that it’s sometimes helpful if society as a whole (aka government) keeps an eye on the rules of the game and makes sure no specific companies, individuals, or industries are unfairly tilting the playing field or stabbing everyone in the eye so that they can perform better in the marketplace. Democrats routinely note the importance of a free market, competitive enterprise, and efficient regulation. I don’t recall ever hearing a Democrat say that we should move to a non-free market system. On the other hand, significant arms of the Republican Party want to abolish regulations and the government’s role in managing broad societal challenges and externalities. There are places where it’s useful to pool our resources through an official process, but a certain portion of the Republican Party is unwilling to acknowledge this and seem to assume that federal government is inherently and wholly evil and bad. Pooling our resources in an official fashion in order to ensure a basic quality of life across the population is somehow a horrible thing to do. To emphasize: there isn’t a significant arm of the Democratic Party that wants to put everything in the federal government’s control. Yes, they want to put a few basic human or American rights under the guidance and fair rulebook of the federal government — access to adequate health care (similar to what every other developed nation has for its citizens), access to satisfactory education, and access to energy, for example. The aim isn’t to turn these sectors into full government, top-down markets — it’s to just make sure some basics are covered and no American will get left without healthcare, with an inadequate education, and without energy simply because they’re poor or going through difficult times. Democrats don’t want a fully powerful federal government — not even close. But Republicans apparently want a fully incapable, neutered federal government (aside from a completely bloated military that apparently has to be prepared to fight the entire world). This stark difference in where the party ideologies end captures the core point of this article: The “middle point” is abnormally far to the right in the US, so far to the right that our political system is out of balance. The core problem with the Republican Party is it doesn’t understand (or won’t admit) that there are aspects of society that need strong federal government involvement and regulation in order to function well. ∴ Our air should be clean enough that kids aren’t collecting cancer from the overwhelming pollution. ∴ Our health care system should provide people in need with life-saving medical care without leaving them a $500,000 medical bill. ∴ Our climate should be protected … if we want to leave our future generations a livable world. ∴ Wall Street gamblers and mega corporations need oversight to ensure they don’t crash our economy and leave hundreds of millions of people struggling. ∴ Pharmaceutical companies need to be regulated to ensure they aren’t turning the country into population of drug addicts and then draining their bank accounts while depleting their physical and mental capacities. The problem that far too many Americans don’t understand is that regulation is needed to put a safe limit on industries that are polluting our air, polluting our water, selling us drugs of “medical” varieties, and gambling with our economy. The problem in the US is very specifically not over-regulation, but under-regulation. Under-regulation is what harms our health — the tune of hundreds of billions of dollars a year. Under-regulation is what led to our last gigantic economic recession (under-regulation that went all the way back to the Ronald Reagan era and deceivingly hit us decades later). Under-regulation is why the United States is facing public health epidemics that other countries aren’t facing. We need better regulation of industries that are naturally inclined to abuse the American public. We do not less regulation. Furthermore, regulation often creates jobs — because it forces innovation. The political assumption on both sides of the aisle is often that regulations somehow cost us jobs, but research has found that forcing companies to innovate, do things in safer ways, and do things in better ways often results in more jobs. It makes complete sense, but we have been so brainwashed with a certain party’s anti-regulation talking points that we typically don’t realize this. As such, Trump has appointed the worst possible people to head several US agencies, often people who simply supported him or did him favors. Talk about crony capitalism! He has put people in the highest positions of government power who fully work to boost specific corporate profits rather than protect human health, the American economy, and American jobs. These people are indeed crushing regulations that were designed to protect Republicans and Democrats alike. They are engaged in departmental suicide, with the apparent assumption that entire departments set up to benefit American society shouldn’t exist. These are governmental departments that have been working hard (if at times slowly) to improve quality of life in the United States. Donald Trump and his corrupted corporate friends, at the incessant request of Fox News and its extremist ideology, have been fully engaged in crushing these departments. The results will be devastating for millions of Americans — no, hundreds of millions of Americans. It’s a tragedy of the first order. It also doesn’t help that certain industries fund the Republican Party and basically buy the policy approach they want. 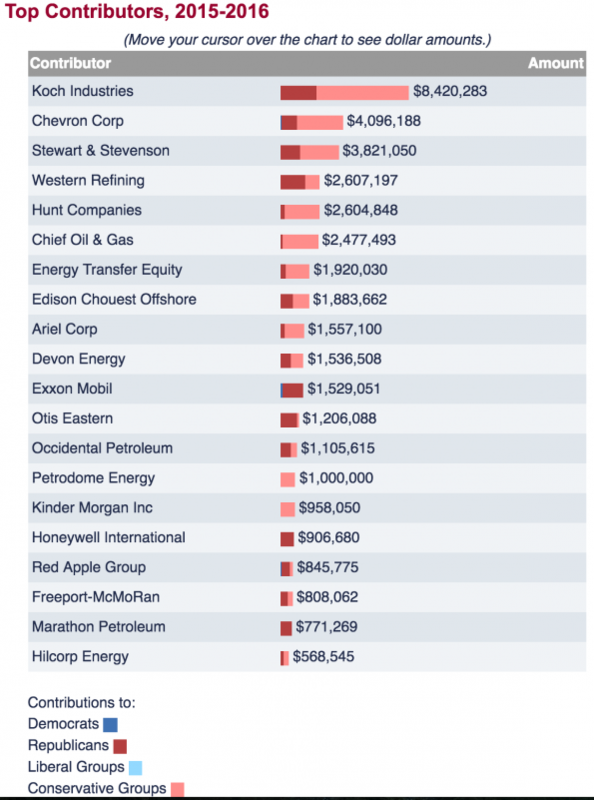 Pollution industries — oil & gas, coal, and others — heavily fund the Republican Party, not the Democratic Party. This is a departure from several industries where the largest companies put significant resources into both parties. Without morals or by simply convincing themselves of a convenient non-truth, Republicans in power return the favor by consistently voting to allow pollution, to let companies pump out carcinogens, to facilitate the premature deaths and suffering of hundreds of thousands of Americans — not tens of Americans, not hundreds of Americans, not thousands of Americans, but hundreds of thousands of Americans. These Republicans tie their decisions to some kind of “pure” conservative ideology — “less regulation is always good.” They don’t pay attention to the details, to the nuance. They apparently assume that even if people prematurely die from the corporate permission to do anything they want, some kind of higher (religious?) preference for no societal/governmental oversight is going to magically end up creating a net benefit. Those lost lives were just sacrifices for a better society. It’s nonsense, of course. Republican voters understand that. They understand that pollution should be prevented and Wall Street billionaires shouldn’t be able to play risky games with our economy. But they are sold on these vague promises of “less regulation” and “more jobs,” so they vote Republican not fully realizing what they are getting into. If a company or industry can choose an option that doesn’t kill or harm humans instead of an old, polluting, harmful option, the company or industry should be forced to choose that more human option. It should not be allowed to funnel a bit more cash into billionaire bank accounts by stripping less rich humans of their lives. But as it stands right now, simple obsession with “free markets” and “less regulation” means that one party is trying to deregulate an already under-regulated country. It is trying to heal a wound by making a deeper cut. it is trying to cure a sickness by throwing you out into the cold rain with no clothes on. It is insane. better candidates running on a platform that is focused on helping average Americans, not poisoning them. Do your part. A government will only be as good as the people involved in running it.